Home Starting a Business Career Corner 5 Things to Know Before You Start Your Ph.D.
5 Things to Know Before You Start Your Ph.D.
Getting your Ph.D. can provide fantastic avenues for research. It can also place you among the elite in your field and open up new job possibilities. To get the most out of your Ph.D. program, go in with a strategy. These five tips from Ph.D. graduates will shape your degree path and your future. If you don’t have an online presence, it’s time to establish one. Future employers will not only review your CV but also research you online. If you have no online presence, then you’re not going to be as competitive. Start by creating a website that has a home page, a bio, and some links to your published work. Use your name as the domain name, or give yourself a catchy nickname. For example, if you are a Ph.D. in Nursing candidate, you could call yourself “Dr. Nurse” and blog about what it’s like to pursue a doctoral degree in nursing. Your blog expands your credibility, and it gives you a chance to make new contacts. Julio Peironcely, a Ph.D. candidate at Leiden University who writes the Next Scientist blog, also says that writing a blog can help you cope with the rigorous Ph.D. experience. Once you’ve set up your website and blog, start getting active on social media. Patrick Meier, who earned his Ph.D. from the Tufts Fletcher School of Law and Diplomacy, suggests thinking of Twitter as the new business card. Most Ph.D.s end up in either the professional world or the academic world, and it’s important to decide early which one is right for you. Once you’ve settled on your path, Meier suggests choosing your research topic based on where you’d like to work. Select research that provides opportunities to interview interesting organizations and important people, and do this for two main reasons. First, in addition to contributing something of value research-wise, you’ll expand your professional network. Second, you’ll vet different organizations to discover whether or not you’d actually like to work for them. Meier also suggests looking for consulting work to complement your research. If you have to miss a few classes to take a consulting job, go ahead and do it — most professors will understand. You can collect some extra money for consulting, which is nice, and you can also strengthen both your work and your research. Engaging in research while consulting will help you create better results for clients, and consulting while doing research opens up new directions and expands your research dataset. In addition to building networks online and through your research, look for opportunities to network in person. Identify and attend conferences that will enhance not only your industry knowledge but also your professional relationships. Look for opportunities to present at different conferences, and make sure to blog and post on social media about conferences and sessions you’re attending. Many of the latest ideas in your industry haven’t made it to peer-reviewed journals yet, and attending conferences keeps you on the cutting edge. Most traditional doctoral degrees come with teaching duties. Even if you’re getting your doctorate online, you should seek out chances to teach. Ask about teaching online undergraduate classes at your current school, or find opportunities to give multi-session workshops. Create a course based on your research, write a syllabus, and pitch it to your department chair or academic dean. Choose a dissertation topic that will keep your interest for years to come. If you want to pursue a professional career, choose a topic that’s relevant to industry or interesting to the media. As you’re doing your research, blog about what you’re exploring, and get feedback from your readers. Their participation will help you build relationships and give you valuable insights into your dissertation. Finally, choose a dissertation committee that gives you autonomy but still takes an interest in your work. Avoid committee members who have a political agenda with the university, and don’t choose members who would stand in your way because they have something to prove. Think of committee members as potential long-term connections, not just temporary evaluators. 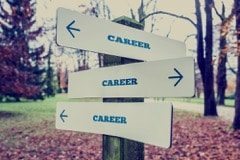 Remember: Every decision you make while you’re earning your Ph.D. should influence your future career. Next articleCould Teaching at a Community College Boost Your Career?